What Size Has Your Sample? 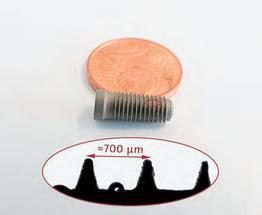 - - Wetting analysis on smallest surfaces – what size has your sample? What Size Has Your Sample? Wetting analysis on smallest surfaces – what size has your sample? Either to survey the homogenity of coatings or wetting ability of ink droplets on paper - using the optical contact angle measuring devices and drop contour analysing systems made by DataPhysics Instruments it is easily possible to analyze and evaluate surfaces non-destructively and precisely on their wetting properties. 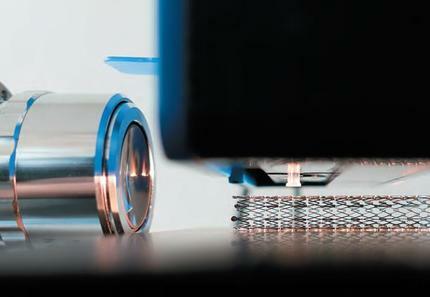 With regard to design and dimensions of the sample this can become a challenge. While the raw material is often available abundandly, the relevant areas on the component may be only a few squaremilli- or even sqauremicrometer in size, as for example on gluing areas for sensors, screw threads or micro chips. In research and development as well as in quality assurance it is often important to test the properties of new developed materials and coatings non-destructively on the final product. With regard to form and size of the sample this can become a challenge. 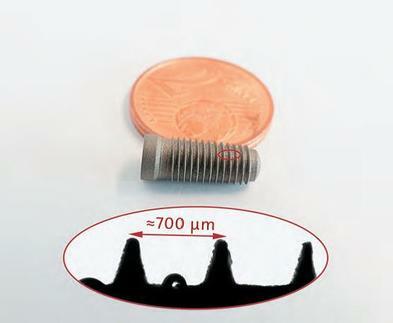 While the raw material is often available abundandly, the relevant areas on the component may be only a few squaremilli- or even sqauremicrometer in size, as for example on gluing areas for sensors, screw threads or micro chips. The DataPhysics optical contact angle measuring devices are excellent for performing wetting analysis even on such tiny solid surfaces. A liquid droplet is dosed via a syringe dosing module and put on the surface of interest. The mounted camera at the device records the procedure and sends the images immediately to the evaluation software on the computer. The drop base as well as the drop contour line are detected and adjusted automatically and the contact angle is calculated directly. Using water as test liquid a statement about the surface properties can be made: low water contact angles <90° are the result of hydrophilic surfaces, while on hydrophobic surfaces bubbly water droplets >90° appear. Moreover, contact angle measurements with more different test liquids allow the determination of the surface free energy. Equally to the surface tension of liquids, the surface free energy analysis shows also the dispersive and polar components of the solid sample; therewith, it is possible to draw additional conclusions with regard to the surface chemistry of the material. Image 1 shows schematically a contact angle θC on a solid surface, with surface tension of the liquid σL, the surface free energy of the solid σS and the solid-liquid-interfacial energy σSL. In order to determine the contact angle on very small surfaces this kind of application requires a modification of the measuring system, especially a decreased drop volume. For that purpose, DataPhysics Instruments has developed – besides the standard dosing technology using glass or disposable syringes for droplet generation in a microliter range – two new dosing systems: the nanoliter dosing as well as the picoliter dosing PDDS. The ratio can be imagined as follows: a microliter droplet wets an area of a few millimeters equal to a pin in size. Using the nanoliter dosing technology droplets a hundred times smaller droplets than usual can be generated (V = 10 nl) fitting, e.g. on the edge of a 2-Cents coin or into screw threats. With the picoliter dosing technology even thirty times smaller droplets can be dosed (V = 30 pl), e.g. on a glass fiber or on the fine wire of a stent. So, what size is your sample? – Gladly the DataPhysics Experts will consult you to determine an appropriate measuring system that fits your requirements.